We have an ongoing fund set up to help care for the many animals injured and left to die on our roads everyday. We call it the CLYDE EMERGENCY FUND named after Clyde who came to our care after a horrific hit-and-run accident. Without our help Clyde would have suffered and died at the road side. The Clyde Fund always need fund raisers and helpers- could you sell Clyde pens, could you set up a pub quiz, run the marathon? All money raised through The Clyde Fund helps care for the animals injured on our roads and left to suffer. Without Clyde's help their lives would be over. Please remember, we are the only organisation who will help these unfortunate strays which have no owners who can pay their bills. Without our "Clyde" they would be dead. Well Done Sophie & Rebecca! The Clyde Fund and the ACS would like to say a special thanks to two very special 12 year old girls called Sophie & Rebecca. Without any help, not even from their parents, they organised a fundraiser in Togher in aid of The Clyde Fund and raised �175.00! This money will help care for animals injured in a road traffic accidents thanks to these two girls efforts. Well done and thank you very much Sophie & Rebecca from everyone in the Clyde Fund/ACS. 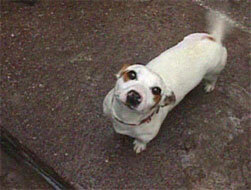 Millie, pictured in the photo, was a sweet corgi X who got very badly injured in a road traffic accident. Millie made the mistake of running after her owner's daughter, who was trying to catch her school bus and did not know Millie was behind her. While she crossed the road Millie was hit by a passing car and suffered severe internal injuries, a fractured pelvis and a fractured Tibula. Extensive surgery was required to ensure that Millie would be able to lead a near normal life and could continue to give her love to the family who cared so much about her. The Clyde Fund was contacted by the treating vet to see if help could be made available to assist the family with the costs needed to pay for Millie's surgery. This was agreed and Millie received the treatment she required. We are delighted to tell you that Millie once more is a picture of health and has promised never to run after a school bus again! Ruben was one hell of a lucky dog. 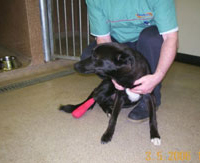 Ruben was hit by a car and suffered a severe degloving injury. In these types of injuries the skin and flesh are stripped from the bone and to say that this is a painful injury is an understatement. A Good Samaritan brought Ruben to the vet, who contacted the ACS for help. Ruben had no owner that we could trace so the Clyde fund came to his aid. Degloving injuries are hard to deal with and can take months to fully heal, so Clyde's help was certainly needed and welcome. Ruben has made a full recovery and has found a new and caring home. It is fair to say that without Clyde's help, Rubens photo (taken in the clinic) would not be here and neither would Ruben. Ruben owes his life to Clyde and told us that he will never forget that. Trixi says Thank You to Clyde and the vets. In an unguarded moment she got out and was run over. A fractured pelvis and severe internal injuries resulted. 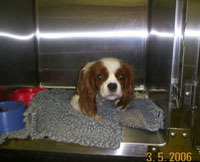 But Clyde came to the rescue and after extensive surgery and treatment this brave little girl found a loving new home. Without Clyde this little dog would not be with us today.